Burton Book Review Rating: Four glittering stars! fame, power, beauty, even loyalty. The beautiful and wealthy heiress daughters of August Price can buy everything their hearts desire. world of the New York gilded society? What price will each woman pay for being an heiress? Set in the famously extravagant Gilded Age of New England, Heiress tells the story of Price sisters Esme and Jinx who could not be more different. Esme wishes that society protocol would allow her to work alongside her father, the publisher of the Chronicle newspaper, and Jinx wishes to be at the forefront of society's opulent stage. Just as Esme is betrothed to Foster Worth, a man she loathes, she realizes it is Oliver who really has her heart. Yet Oliver grew up with Esme as a servant of her household, Esme's parents forbid the lowly match and Esme's world is turned upside down, especially since little sister Jinx believes it is herself who should wed Foster Worth. The storyline that follows eventually shows the bonds of a family lost and found again as the narrative follows each sister's path in separate sections. Esme is forced out of New York City and begins a new life amidst the rough ways of Montana, while Jinx becomes that pinnacle of society's finest that she so coveted. Yet, trials and tribulations threaten both of the sister's happiness as each realizes that being a daughter of fortune does not buy love, and that perhaps being true to oneself is the most important thing to accomplish. Esme and Jinx's story are embellished with a wide cast of characters who each have their own story to tell, from Oliver Stewart who manages to haunt Esme forever, to Jinx's brother-in-law Bennett who may not be as bad as the gossip columns report. The dual story of the sisters is set in New York City's finest mansions, and then in the dust and danger of mining country Montana as Esme pursues her dreams of being a newspaper publisher. Heiress has a little bit of everything, from romance to mystery set in intriguing times of the past with the spiritual undertones as the sisters questioned their faith. I was surprised by some of the twists presented and found the narrative hypnotic, as I was eager to learn the fate of these two families twisting with the deceit of society. 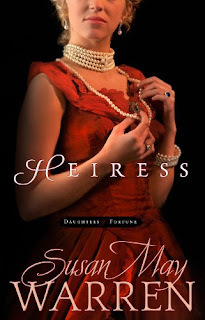 Established author Susan May Warren has another hit on her hands with this series, and I cannot wait to continue the saga of the Worth and Price families with her upcoming Daughters of Fortune novels.